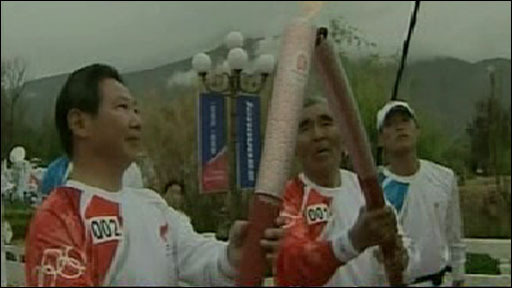 The Olympic torch has been carried through the Tibetan provincial capital of Lhasa amid heavy security. The 11km (seven mile) parade passed off smoothly, with the flame carried past apparently hand-picked spectators. The BBC's James Reynolds says there is a staggering security presence in the city, three months after violent protests broke out. Ethnic Tibetans clashed with security forces and Han Chinese in March in the biggest protests for two decades. 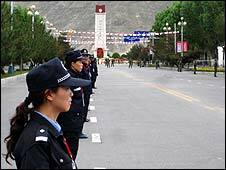 Foreign journalists have been barred from Lhasa since the unrest. But reporters representing about 30 international news organisations have been allowed into the city in a closely monitored group to cover the torch relay - widely considered the most sensitive leg of the flame's journey around the world and through China. Torch bearers in white-and-red track suits carried the Olympic flame through Lhasa's streets, beginning at Norbulingka, the former summer palace of the Dalai Lama, the Tibetan spiritual leader now living in exile in India. Our correspondent says he passed through at least six checkpoints as he was driven in an official convoy to the start of the relay. Each member of the crowd has a badge, suggesting that spectators were specially chosen or vetted for the ceremony, he says. The Lhasa relay is important for Beijing because it wants to show that Tibet is very much a part of China, he adds. After being taken through the city's streets, the flame was brought to a closing ceremony where officials were giving speeches at the iconic hilltop Potala Palace, the traditional seat of Tibetan rulers. On the eve of the parade, small crowds of people were wandering in the square in front of the palace, as performers practised for the ceremonies, our correspondent says. But he says he also saw four military trucks near the area - two of which were filled with soldiers in riot gear. Ahead of the event, Palma Trily, vice-governor of the Beijing-backed Tibetan government, said he was confident the relay would pass through the city without incident. "We have sufficient confidence and capability to turn tomorrow's Lhasa torch relay into a big success," the Associated Press quoted him as saying on Friday. A planned three-day stay in Tibet has been cut to one day because of schedule adjustments linked to last month's Sichuan earthquake, officials said. In a separate development, the state-run Xinhua news agency reported on Friday that more than 1,000 people detained after the protests in Tibet had been freed. It quoted a senior official as saying 116 people remained in custody awaiting trial over the unrest. Are you in Lhasa? Send us your comments and experiences.